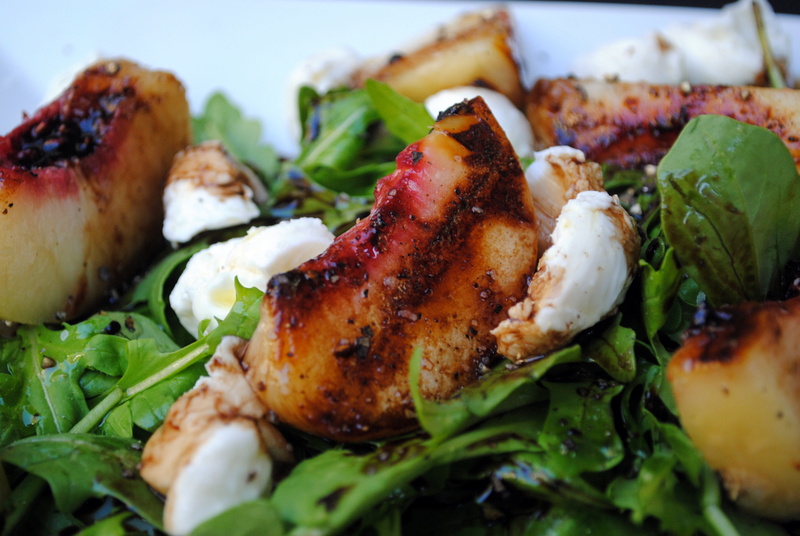 Grilled Peach and Buffalo Mozzarella Salad | Clare Cooks! Posted on August 31, 2011 by Clare Cooks! I am trying to make the most of the last few weeks of summer produce, which apparently means, peaches go with everything. Breakfast, lunch, dinner, dessert, it doesn’t matter, peaches belong there. And they definitely belong in this salad. I have wanted to grill peaches all summer, I was planning on a dessert originally, but when I saw this recipe and that it involved balsamic and peaches, I quickly changed my mind. This salad was absolutely perfect. The peaches were very ripe and juicy and grilling them brought out the flavor even more. The balsamic reduction, was slightly sweet, but maintained that delicious vinegary tang that really complemented the sweet peaches. If you don’t have a gril, fear not! I totally cheated and used a grill pan! I would highly recommend this salad. It would probably be the perfect meal to enjoy over your Labor Day weekend! Combine the vinegar and thyme in a 2-quart saucepan and bring to a boil over medium heat. Reduce the heat to a summer and cook until the mixture is thick, syrupy, and reduced to about 1/4 cup, about 6 to 9 minutes. Remove from heat, disgard thyme sprigs, and season with a pinch of salt and a few grinds of black pepper. Rub the peaches all over with 2 teaspoons of the oil and season lightly with salt and pepper. Grill the peaches cute side down until lightly charred, 3 to 4 minutes. Transfer to a cutting board and let cool slightly. Slice each half into thirds. 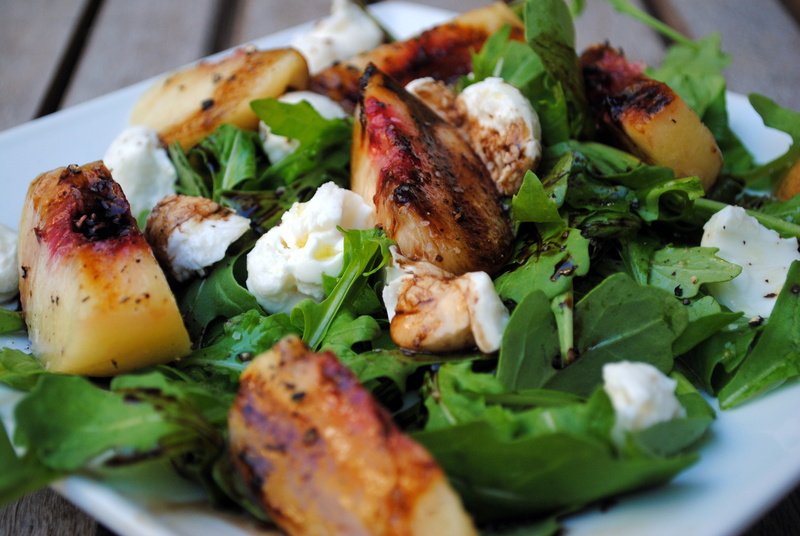 In a medium bowl, toss the arugula with the remaining 2 1/2 teaspoons of oil and season to taste with salt and pepper. Arrange on a platter. Top with the buffalo mozzarella and peaches and drizzle with about 2 tablespoons of the balsamic reduction, adding more to taste. Season to taste with salt and pepper. I saw grilled peaches in another recipe and they sound delish! I have to get in a grilled peach before the season ends. This seems to be a popular salad that I think I will try. Thank you for posting the recipe. Pingback: Sunday Summary: September 4, 2011 | Clare Cooks!